Live Player is designed to help Mediabank users extract media clips from live broadcast streams and publish them to the Library for further processing. Mediabank "Live player" acts as the tool to extract highlights from the event and Library is the distribution platform for further distribution/publishing. From the Mediabank main menu, locate and click the Live Player button. The Live Player opening screen will appear, waiting for you to select an input source. It should be similar to the below example. You will see a the opening screen of the Live Player, partly illustrated below. The illustration show the top left side of the Live Player opening screen. If you wish to return to the Mediabank Main menu, click on the "Mediabank Live Player" icon. Once selected, the live stream will appear in the "Live Player" window and automatically play the stream live. Hoovering your mouse pointer over the player window will activate the control bar. The Live Player starts with the "live" view, but you can actually move "back in time" taking use of the Live Player buffer. In the example below you can read from the "Total buffer" that there is close to one hour buffer zone available. (Different streams may have different buffer size). You can navigate very efficient in the buffer zone by dragging the "marker" to left or right. Even if the stream is live you can navigate as far back as the buffer allows and create clips. The Live Player have three different states. "Live", "Preview" and "Buffered". The buffered state is shown in above illustration, displaying only time. Below illustration shows the status bar displaying the local time of the source stream. The "Live Player" present the live stream source location time. The red dot with "Live" indicates you simply watching a live stream. Audio track - If the stream contains additional audio language tracks, you may select the appropriate. Same as above. The PREVIEW indicates you simply watching a clip that contains a "mark in" time and a "mark out" time. Audio track - If the stream contains additional audio language tracks, you may select the appropriate before you actually create the clip. -1s Rewinding 1 sec (24 frames). +10s Winding forward 10 sec. 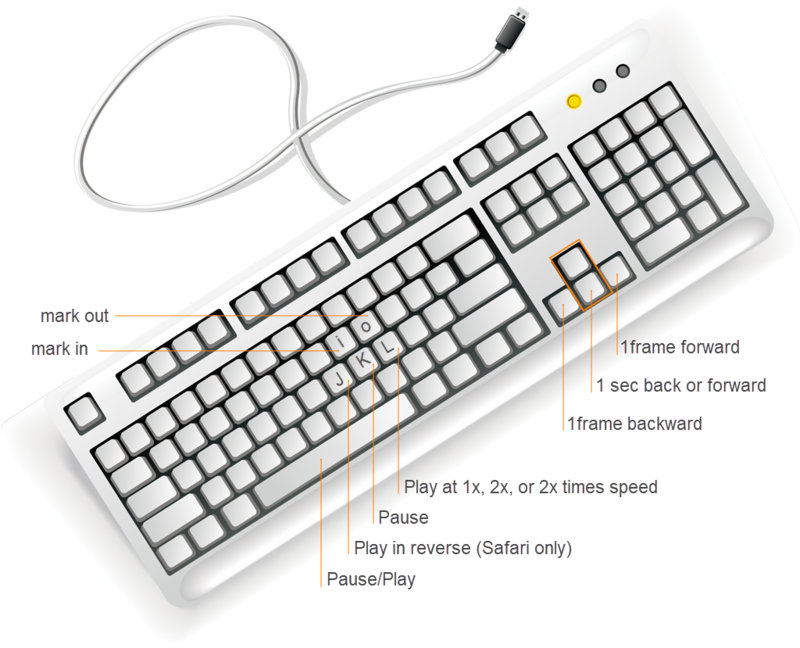 There is also a short cut-trough keyboard functions available. The letter i = mark in with the corresponding o = mark out . You can also use the arrow buttons on your keyboard to navigate. Left/Right = 1 frame back or forward. Creating a Clip is easy. Watch the live or buffered stream and press (1) "mark in" to mark the beginning of the clip. Automatically (2) suggest a title. (live stream name + the clip starting time) You may overwrite it. The (4) "out" time is set. You may also use the (6) "Preview" button to watch the clip. You are free to navigate with the player control buttons to move back an forth trough the clip. Navigate with the accuracy from 10sec, 1sec and down to frame level. Press "mark in" or "mark out" to adjust the clip. Finally, (7) create the clip. The clip can have the minimum length of 5 sec and a maximum length of 30 min. All clips will be stored in the Live Player storage area. You can choose to list your clips only, or include clips from your group members as well. All the clips that are published to Library are stored with the Tag "LivePlayerClip" making it easy to locate within the Library. It is not possible to select multiple clips for upload. Only one clip can be uploaded (published) at the time. The below clip view explains the options available. As with the "Live Player", you may hoover over the clip to enjoy the same control bar. In addition, you may watch the clip in full screen mode by clicking on the square bracket in the control bar. Each clip "contains" a media player, allowing you to watch the clip inside the thumb view and at the same time follow the live stream in the main "Live Player" window. When playing the Clips, the sound from the "Live Player" will be muted. You must manually adjust the "Live Player" sound back to preferred level from the control bar. Looking at a clip, you have four options. Click the poster to start the mediaplayer, delete the clip, download it, or publish it to library. Selecting (2) "Download Clip" will download the clip to your computer/server with the same properties as the broadcast stream but it will be in a compressed format. Selecting (3) "Publish to Library" will initiate an upload to Library. Depending on the live broadcast stream quality, you will have two different options when publishing. (1) "Send web quality clip to Library resulting in a clips with the same preferences as downloading it to your own computer/server. (2) "Order to library from......." will publish the clip as streamed. Mediabank will not compress it. If no recording is initiated, then there is no place to extract the broadcast stream from, and you will receive the (3) "Error" message as shown in above illustration.